Why does the "Icarus" make engine noises and fly thorugh the air before crashing when it has no engines?! Q: Why does the "Icarus" make engine noises and fly through the air before crashing when it has no engines?! A: Good question. As you all know, when the "Icarus" makes reentry in the first movie, it does so breaking through the clouds over a desolate landscape. We hear some weird 'spacey' sounds and whines that don't match any known engine or rocket in operation that we currently have. These whining sounds oscillate up and down and fade in and out, followed by what sounds like a rocket thruster kicking in at odd moments. The reasoning that I am using for the ship making 'engine' sounds is that the sounds are pretty weird, kind of like a 'spacey' warp drive and then we are introduced to sounds that are similar to a rocket thruster firing on and off. It is clear that ANSA has a gravity drive and at least an artificial gravity field generator technology (see here). Seeing as how the Icarus has a working gravity field generator upon separation from the main engines / body of the (rest of the) ship, then it would be safe to assume that the sounds that the Icarus is making are the sounds of the gravity field generator activating and deactivating (either it or the flight control system is malfunctioning). Every time it comes on, you get the 'spaceship whine' noise, and when it goes off, you get the sound of air rushing past the spaceframe (the sound that you think is a rocket motor firing). High speed air, moving over a surface, roars. Listen to a Cat 3 or higher hurricane and you will hear the wind roar. Wind at speed, makes a loud noise. I propose that since the Icarus has a integral gravity field generator, that it can land 'softly' using the gravity field for limited maneuvering (notice it has no thruster nozzles or any kind of reaction control motors anywhere) by changing the polarity of the artificial gravity field along its vector of flight. This would also explain why an Apollo space command module returns to Earth riding three huge parachutes to slow it down, and the Icarus does not. 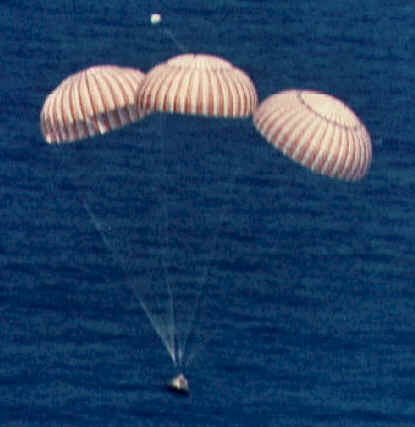 APOLLO returns with the aid of three deceleration parachutes. Icarus shows no sign of any type of reentry deceleration devices. The lack of evidence for any kind of emergency deceleration parachutes, parafoil, or any similar technology, and the fact that the command module hits the water at a speed and angle that should not only totally destroy the command module, but reduce the crew to red paste in their chambers clearly shows that forward velocity and impact energy are being controlled and negated by deliberately manipulating the effects of gravity, and that this is being done artificially through technology.